ORCA vs. Gordon: a battle of election-day poll-monitoring systems. 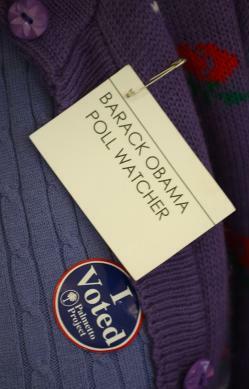 A Barack Obama poll watcher observes the voting January 26, 2008 in Denmark, South Carolina. Project ORCA will rely on 34,000 volunteers in swing states on Election Day, in an effort to keep track of who is voting at key polling places. Romney staffers will use the data to help them target their get-out-the-vote efforts before the polls close, in hopes of gaining an edge over Obama’s grassroots operation. “There’s nothing that the Obama data team, there’s nothing that the Obama campaign, there’s nothing that President Obama himself can do to even come close to what we are putting together here,” Romney Deputy Political Director Dan Centinello said Wednesday night in a training call for Project ORCA volunteers, which The Huffington Post called into.